Many paleontologists consider the cause of the extinction of most of the dinosaurs to be a closed case: About 65 million years ago, an enormous extraterrestrial object struck the Yucatan area in Mexico, creating the infamous 200-kilometer-wide Chicxulub impact crater. The energy released on impact, which equaled about 100,000 gigatons of TNT, changed Earth's ecosystem and led to the worldwide mass extinction event at the boundary between the Cretaceous and Tertiary periods (K/T). A crew drills core samples near the Bravos River in Falls County, Texas, to try and better understand the events that led to the demise of most dinosaurs 65 million years ago. Images are courtesy of Gerta Keller. Not so, according to Gerta Keller, a geologist at Princeton University in New Jersey. Analysis of new core samples from Texas support her previous research from 2004 that the Chicxulub meteor struck about 300,000 years prior to the K/T extinction event and, therefore, did not cause the event, said Keller on Tuesday at the Geological Society of America's (GSA) annual meeting in Philadelphia. The key to finding out what happened and when it happened lies in analyzing layers within the core samples that span the K/T boundary, Keller said. In previous research, Keller and colleagues analyzed core samples collected within and outside the crater in northeastern Mexico. They identified the K/T boundary by looking at changes in carbon isotopes, as well as a decrease in the diversity of microfossils. Keller's previous research also turned up a layer of tiny glass-like blobs of melted material  evidence for the Chicxulub impact event. Instead of coinciding with the K/T extinction event layer, however, the two events in the core were separated by a segment of normal, layered sediments in the core, Keller said. By dating tiny, fossilized sea creatures in that segment, Keller found that the Chicxulub impact occurred about 300,000 years before the onset of the extinction event, she said. Not everyone was convinced by Keller's previous analysis, however. "The worst place to look is close to the crater," said Sean Gulick, a geologist at the University of Texas in Austin who studies impact cratering, in an interview at this week's GSA meeting. That's because the immense energy of impact more greatly affected regions closer to the crater, he said. There is "no other geologic process that comes close to that energy release." The entire core sample would have been disturbed by such an event, he said, as earth materials were excavated and mixed, and then hung out in the atmosphere (some for years) before raining back down to the surface  rendering useless Keller's method of dating sediment layers. To try and iron out the controversy, Keller and her colleagues set out to further test her previous results by collecting core samples from a location farther away from the Chicxulub impact. 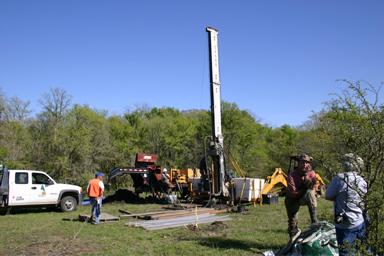 The team selected a site along the Bravos River in Falls County, Texas, which is 1,000 kilometers from the Chicxulub impact. A crew operating a drill rig exhumed three holes between about 23 and 30 meters deep that crossed the layer at the K/T boundary. 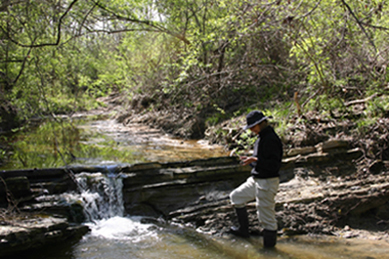 Gerta Keller studies sediments in the Bravos River in Texas. Details within new core samples collected nearby arguably suggest that the Chicxulub impact event precedes the Cretaceous/Tertiary extinction event by 300,000 years. The team analyzed the new cores and found that, similar to previous samples, a section of normal, layered sediments separates the K/T extinction event layer from the Chicxulub impact event. Dating the fossilized sea creatures also supports the idea that the segment represents a 300,000-year-long gap between the extinction and the impact, Keller said. Detailed distinctions cannot be made within the new cores, however, as Texas is still close enough to the crater to have been disturbed by the impact, according to Christian Koeberl, a geochemist at the University of Vienna in Austria who studies impacts. The segment of the core affected by the impact would include more than just the impact layer, and would include regions above and below it, he said in an interview at GSA, negating any implications the segment might have had for determining the relative timing of the events. Gulick agrees, and said that the previously studied Sudbury crater in Ontario, Canada, disturbed material tens of meters thick at distances hundreds of kilometers away. And it was smaller than the Chicxulub impact. Supposing, however, that Keller is correct, and the Chicxulub impact did not kill the dinosaurs, the finding begs the question as to what caused the mass extinction. Keller suggests that a yet-undiscovered impact on the scale of Chicxulub must have occurred, to explain the anomalous presence of iridium  an extremely rare element associated with certain types of meteorites  at the K/T boundary.